Gracias. 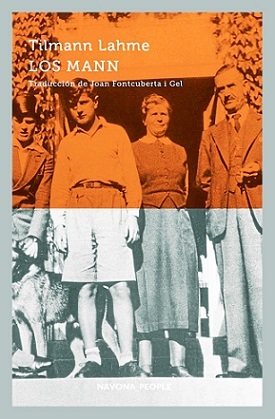 Hoy voy a la libreria a buscarlo o encargarlo. Tiene buena pinta, sí. Parece que incide en las circunstancias exógenas que pudieron cargarse al Imperio, aunque eso de la "época feliz" de Marco Aurelio sería discutible. 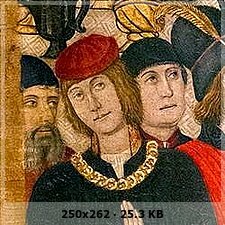 Las historias sobre de "decadencia" del Imperio han sido excesivamente tributarias de Gibbon y autores como Heather o Ward Perkins han ofrecido otro aspecto con pruebas sobre la mesa. 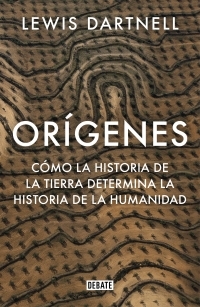 Habrá que seguirle la pista a este libro. 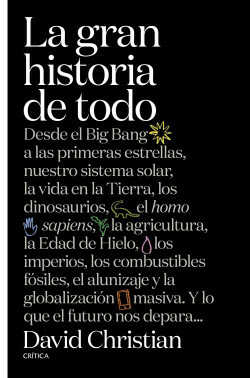 David Christian, el creador de la «big history», de la «gran historia» que enlaza la evolución del cosmos, de la vida y de la humanidad para ofrecernos una perspectiva distinta de los grandes problemas del Antropoceno, culmina su obra con este libro realmente único, que discurre desde el big bang, el sistema solar, la aparición de la vida, los dinosaurios, el homo sapiens y los grandes imperios hasta la globalización. 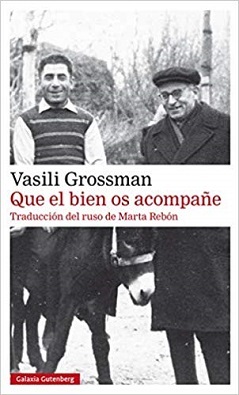 Un libro que ha despertado el entusiasmo de lectores como Bill Gates o el físico Carlo Rovelli quien considera esta disciplina «un método espectacular para, a través de la historia, poner orden en todos nuestros conocimientos sobre el mundo». Ya ocupa un lugar en mi listado de futuribles. Sciurus, toma nota, aunque a lo mejor ya te has enterado: Navona lanzó en enero pasado una biografía de la familia Mann, obra del investigador Tilmann Lahme. Yo por lo menos me apunto. - THE LONG MARCH 1934-35: The Rise of Mao and the beginning of modern China. De Benjamin Lai y Adam Hook. OSPREY CAMPAIGN. In attempting to discern how Paleolithic Homo sapiens "became human and in the process began to make art," Lewis-Williams, an emeritus art historian at a Johannesburg university, focuses on the glorious but mysterious cave painting of western Europe, made between 45,000 and 10,000 years ago. Lewis-Williams has two main hypotheses: the first contends that mankind could only engage in image-making upon developing "fully modern consciousness," or an ability to process mental images in a variety of manners. The second argument insists that cave painting was a byproduct of religious belief and helped maintain a society with strict class distinctions. 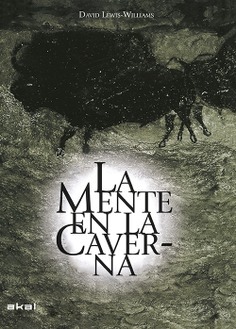 Recent research findings in the fields of archeology, anthropology and neuropsychology, among other social and physical sciences, bear upon the elaboration of these two ideas in the first two thirds of the book, while the final third details the author's interpretations of the animal and geometric imagery found in such sites as France's Lascaux and Gabillou caves. Having presented the science supporting his views of prehistoric images, Lewis-Williams is particularly winning as he subtly reveals his devotion to the art and people he attempts to explain. He is sensitive to those who "saw real things, real spirit animals and beings, real transformations" on cave walls. While writing about our forebears of tens of millennia ago, the scholar rightly suggests important similarities between the functions of art in the Paleolithic and current eras. Now, as then, he argues, images maintain spiritual power; art can still have a direct impact on social relations, leading to unity or division. Este también me resulta llamativo: Los caminos del mundo. 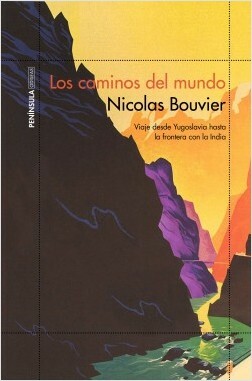 Viaje desde Yugoslavia hasta la frontera con la India, por Nicolas Bouvier. En general, qué buenas son las nuevas portadas de esta colección, la de Viajes, de Península. Marcus Porcius Cato ("the Younger") is most famous for being Julius Caesar's nemesis. His sustained antagonism was in large part responsible for pushing the Romans towards civil war. Yet Cato never wanted war even though he used the threat of violence against Caesar. This strategic gamble misfired as Caesar, instead of yielding, marched on Rome, hurling the Republic into a bloody civil war. Refusing to inhabit a world ruled by Caesar, Cato took his own life. Although the Roman historian Sallust identified Cato and Caesar as the two most outstanding men of their age, modern scholars have tended to dismiss Cato as a cantankerous conservative who, while colorful, was not a critical player in the events that overtook the Republic. 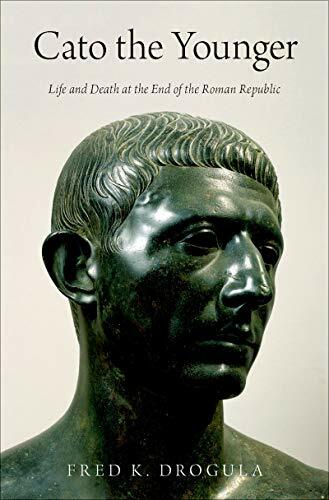 This book, in providing a much-needed reliable biography of Cato, contradicts that assessment. In addition to being Caesar's adversary, Cato is an important and fascinating historical figure in his own right, and his career-in particular, his idiosyncrasies-shed light on the changing political culture of the late Republic. Cato famously reached into Rome's hallowed past and found mannerisms and habits to adopt that transformed him into the foremost champion of ancestral custom. Thus Cato did things that seemed strange and even bizarre such as wearing an old-fashioned tint of purple on his senatorial toga, refusing to ride a horse when on public business, and going about barefoot and without the usual tunic as an undergarment. 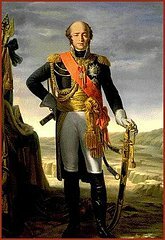 His extreme conservatism-which became celebrated in later ages, especially in Enlightenment Europe and revolutionary America—was actually designed to give him a unique advantage in Roman politics. This is not to claim that he was insincere in his combative promotion of the mos maiorum (the way of the ancestors), but his political manipulation of the Romans' reverence for their traditions was masterful. By providing a new, detailed portrait of Cato, the book also presents a unique narrative of the age he helped shape and inadvertently destroy.